Featuring 360° visibility, as if suspended weightless at the center of the case by a sapphire mainplate and bridges, Manufacture Corum Caliber CO100 is the true star of the new Golden Bridge Tourbillon Panoramique. 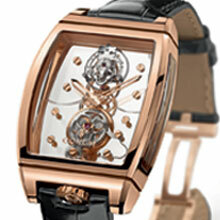 This finely openworked translucent movement is equipped with a cantilevered or “flying” tourbillon: freed from an upper bridge, it appears to be levitating above the movement. The story goes that the farmer-watchmakers, who annually left their fields for the workbench when winter came, drew inspiration from the delicate perfection of snowflakes in creating toothed wheels and gears. With the Golden Bridge Tourbillon Panoramique, reality has never so closely mirrored legend. The delicately openworked parts of the new baguette-type movement from the Manufacture look as if they are governed exclusively by a will to put on a spectacular show. Floating in a revisited tonneau-shaped case and enhanced by a flying tourbillon that further accentuates the weightless effect, this andwound Caliber CO100 only fully reveals its secrets upon close inspection: the mainplate and bridges are in sapphire, forming a transparent hand-polished framework providing 360° vision, like a panoramic snow-covered landscape. Now an acknowledged style signature of the Corum brand and its Bridges collection, the baguette movement is a in itself a masterpiece of horological mastery. Beating at 21,600 vibrations per hour (3 Hz) and endowed with a 90-hour power reserve, Caliber CO100 is equipped with a highly distinctive tourbillon. A majestic mechanism invented in 1801 to compensate for the disturbing effects of gravity on the regulating organ, it remains one of the most difficult Haute Horlogerie complications to produce. The beating heart of the watch – the balance-spring along with the lever and the lever-wheel – a subtle invention in its own right, is placed inside a carriage that spins on its axis. Never one to shrink from a challenge, Corum has opted here for a so-called flying tourbillon, meaning with no upper fastening point. The entire device, adorned with a finely engraved Corum key, is held to the sapphire mainplate by its base alone. This results in a disconcertingly light and exquisitely balanced effect, as if a spinning top were twirling in slow motion, yet without ever tipping over. An ethereal mechanism featuring certain gear trains equipped with “wolf’s teeth”, a sure token of tradition and quality, Caliber CO100 has one of the smallest time-setting systems on the market. The screws are directly secured to the various sapphire parts that are hand-polished – a particularly demanding task given the delicate nature of sapphire – to ensure a perfect fit. The movement is housed within a tonneau-shaped case typical of the Corum Bridges collection. Water-resistant to 30 meters, the new Golden Bridge Tourbillon Panoramique is interpreted in three variations naturally issued in limited editions: ten with an 18K red gold case; five with a baguette-set 18K red gold case; and five with an 18K red gold case set with round diamonds. Each version is delivered with two hand-sewn crocodile leather straps – one black, the other brown – secured by an 18K red gold triple folding clasp engraved with the Corum logo.